From March 24 to April 1, Performatik17 will be entering the intriguing twilight zone where artists tinker with the codes of visual arts and performing arts. For this fifth edition of Performatik, Kaaitheater is joining forces with 13 partners across Brussels, ranging from renowned venues to small scale artists' organisations, specialising in either live arts, the visual arts or both. They all contribute their own expertise. 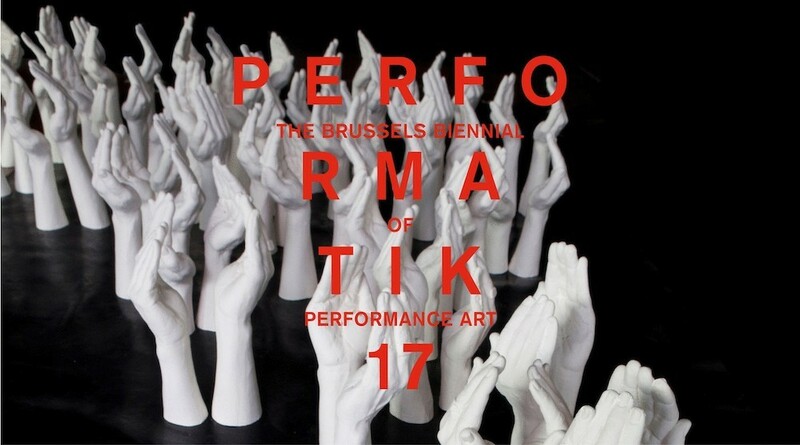 Performatik17 presents works by more than 40 artists on 20 locations throughout the city: black boxes, white cubes and the streets of Brussels. Performatik17 is organized by Kaaitheater in association with Argos, Beursschouwburg, Boghossian Foundation - Villa Empain, BOZAR, Cultureel Centrum Strombeek, Centrale for Contemporary Art, Enough Room for Space, Muntpunt, Passa Porta, Q-02, Wiels, workspacebrussels & ZSenne art lab. Body sculptures play a central role in this edition of Performatik, that is subtitled Bodily attempts at social sculpting. From movement in sculptures to the sculpting of movement. Never monumental, always fragile. Performatik17 opts for probability over certainty. For the careful creation of social sculptures. On www.performatik.be you'll find more information about all artists, as well as day by day programmes. The Performatik Salons - a series of talks between artists and curators - are being announced here too. The Performatik17 Opening Lecture will be held by Dorothea von Hantelmann, art historian and author of the book How To Do Things with Art. In Performatik17, artists seek out the boundaries between the visual and the performing arts and play with your position as a spectator. For if a revival of performance art is bringing about a renewal in the arts, then this now chiefly lies in the radical questioning of your position: your gaze as a museum visitor, your role as a theatrical spectator, or something beyond this. In Performatik17 the intrinsic meaning of a work is less important than the act of creating something together in the here and now. This is what we collectively so crave—at a time in which even "public" space no longer brings people together. Instead it seems to be an accumulation of individual islands, each encased by a bubble—the bubble of facebooktwittersnapchatinstagram through which we pass on experience before we fully experience it ourselves. Or vice-versa: we follow an experience somewhere else without being present ourselves. In Performatik17, Alioum Moussa and Maarten Vanden Eynde invite you for a discussion about what (in)dependence means. Daan ‘t Sas and Lotte van den Berg enter into a wordless discussion with you. And Kate McIntosh allows you to rediscover the playful and tactile side of communication. Visual artist Grace Schwindt—in her first creation for the theatre—infuses Bernini’s sculpture of Daphne and Apollo with movement. Conversely, choreographer DD Dorvillier presents a danced collection of her works while a youngster in the New York '90s. Ieva Misevičiūtė heads outside to explore survival modes in the public space. Elsewhere there is construction and demolition going on: Philippe Quesne brings the landscape painter Caspar David Friedrich’s studio onto the stage, while Feiko Beckers constructs hermitages on stilts. In the meantime, Jozef Wouters, Meg Stuart and Jeroen Peeters construct the artists’ spaces of the future. This edition of Performatik puts two historical anchor points in the spotlight. Trajal Harrell and Ola Maciejewska take as their starting point the work of Loïe Fuller, a performance artist—long before the term was invented—who influenced both Picasso and modern dance. Bozar will be paying tribute to Yves Klein by showing unseen masterpieces and rarely exhibited visual works. Pieter Van den Bosch and Miet Warlop are literally empowering the opening of the exhibition, turning Klein’s heritage into a modus operandi for today.